Added iPad 3 on September 22nd; also added link to Anandtech article. Our iPhone 5 was delivered at 2:52pm PST (Sept 21). So we rushed to get these benchmark results to you. Geekbench 2 runs two processor tests (integer and floating point) and two memory tests. Below is the overall rating. HIGHER number is faster. RED bar indicates fastest smartphone in this test. GLBenchmark 2.5 is a performance testing utility. We focused on two offscreen graphics tests to make it fair since the devices tested have different screen resolutions. The first test is a game animation run at 1080p with complex textures. HIGHER number is faster. RED bar indicates fastest smartphone in frames-per-second (FPS). The Egypt Classic offscreen test is also at 1080p but with less complex textures. HIGHER number is faster. RED bar indicates fastest smartphone in frames-per-second (FPS). The iPhone 5 was the clear winner in all five tests. 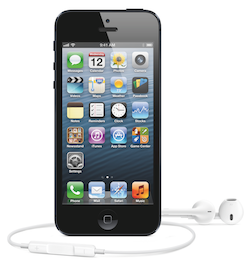 Apple claims it is twice as fast as the iPhone 4S. That's definitely true. In the case of Linpack, it is four times as fast! 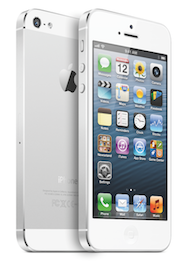 In addition, the iPhone 5 is 4 times to 28 times as fast as the iPhone 4, depending on the test. The iPad 3 was close to the iPhone 5 in the GLBenchmark graphics tests but was closer to the iPhone 4S on the three processor tests. The Galaxy S III we tested was the SCH-1535 model sold by Verizon Wireless USA. According to the creators of GLBenchmark, the GT19300 model runs the Egypt Classic benchmark faster than the iPhone 4S (59 FPS best score) but it's still slower than the iPad 3 and iPhone 5. HOW FAST IS 4G LTE? Our iPhone 5 is on AT&T contract. Our city was recently added to the 4G LTE support list. We did some brief testing. We saw as high as 35Mbps downloads and 14Mbps uploads. Impressive and at least twice as fast as the fastest Verizon 4G LTE speeds we've seen on an iPad 3. Want a really cool BAMBOO case for your iPhone 5? Check this preorder offer from Grove.